As summer draws to a close, we should make the necessary preparation for the coming of autumn and winter. We all know how brutal the last winter in St. Charles was. So, if you haven’t prepared yet, start by inspecting your home for any concerns that may cause problems when the seasons start shifting to chilly days. We heard a lot of residents complained about last winter’s implausibly high electric bill. We suspect that old windows, especially if they’re more than 15 years old, could be playing tricks on some. Old windows could be leaking out too much warm air through the cracked or rotting frames. This of course can cause the heating system to work twice as hard to provide the warmth indoors, and consequently can increase power consumption. Again, your shutters and panes, in particular, may need a thorough look if you don’t want any of those billing concerns come winter. For one, you want to make sure that your old windows are replaced with more durable and energy-efficient br ands to provide your home with better insulation. When it comes to energy efficiency, windows from Renewal by Andersen® st and out because of their unique features. With super durable Fibrex® frames and Low-E4® Glass, all our windows have been certified by EnergyStar, a highly recommended br and by home experts. Because the frames are fabricated to never warp, chip, fade, rot, or rust, each window is designed to remain intact in even the fiercest of weather. Furthermore, the Low-E4 glass helps minimize the workload of your heating systems by limiting the penetration of the sun’s infrared rays that cause temperature fluctuations indoors. Renewal by Andersen of St. Louis and its team of experts in windows installation in St. Charles MO can help you and your home prepare for winter. Like most home improvement projects, this summer season is the best time to take up those long delayed repair or replacement plans. 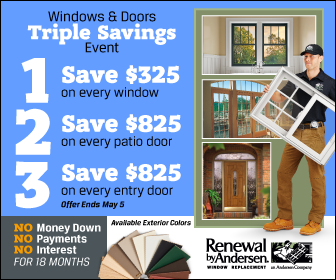 For more information on St. Charles Missouri energy efficient windows, contact us at Renewal by Andersen of St. Louis today.